With this issue of Connections, we are excited to unveil a new look and feel for the Health Care Homes (HCH) program! This makeover is part of a larger effort to sharpen our brand with more professional images and strategically focused, user friendly messaging. Check our website for updated resources to help educate patients and partners about HCH. Is there something we can do to help promote your work? Let us know! We love hearing from you. Stay tuned for more information in the LEARN bulletin and on the HCH website. HCH, Certified Community Behavioral Health Clinics and Behavioral Health Home services providers and their community partners are invited to participate in a full day event focused on behavioral health integration in Minnesota. Joan King from the National Council of Behavioral Health will be the featured speaker. Tuesday, September 25, 2018; 9:00 a.m. – 4:00 p.m. The event is free and includes lunch; registration is limited to 150 participants. Register on the MDH Learning Management System. New to the MDH Learning Management System? Start here for step-by-step instructions on creating a user profile and searching and registering for HCH learning opportunities. Tim Jenkins recently joined the HCH team as evaluation coordinator. Tim has worked in environmental health, emergency preparedness, food policy, and chronic disease prevention. Before HCH, Tim was a data analyst for the Minnesota Department of Agriculture Produce Safety Program, and prior to that was a planner principal with the Minnesota Statewide Health Improvement Partnership. Tim enjoys working on teams to advance health equity, quality improvement, and data and information sharing systems. Did you know? The Minnesota HCH Data Portal is a Great Tool for Quality Improvement! The HCH data portal is a great quality improvement tool for HCH clinics. Clinics can review annual performance rates, improvement benchmarks, and comparisons to other Health Care Homes and data trends over time. Benchmarking data can assist with monitoring clinic improvement goals and updating quality plans in addition to real-time actionable registry data. The data in the Health Care Homes benchmarking portal is updated annually by Minnesota Community Measurement (MNCM) after Cycle A and Cycle B data submission and analysis processes are completed. Cycle A - 2018 (2017 dates of service) measures are in the HCH Data Portal for Optimal Diabetes Care, Optimal Asthma Control – Adults, Optimal Vascular Care, Depression Remission at 6 months, Optimal Asthma Control – Children, Asthma Education & Self-Management - Children and Adults, and Colorectal Cancer Screening. Cycle B - 2018 (2017 dates of service) Pediatric /Adolescent Mental Health measure will be in the Data Portal November 15, 2018. Log on the portal today at https://hch-data.org/login* to see how your clinic compares to the Health Care Homes high performance benchmarks and the Health Care Homes average. *If your clinic does not have access to the portal, request access by clicking on the “Contact Support” link on the HCH data portal login page. Child Asthma Education & Self-management! The Native American Community Clinic (NACC) is a Federally Qualified Health Center offering a full range of health services (medical, dental, and behavioral health) and community focused care. NACC has approximately 17,000 patient visits every year and 85% of their population is Native American. Their mission is to serve the Native American community with programs designed around that purpose. The burden of asthma in Minnesota falls disproportionately on people of color and in poverty. NACC is increasing the percent of children with asthma who receive asthma education, instruction on self-management of their condition and has a written asthma management plan. January 2018 (2017 dates of service) - HCH Benchmarking Results show NACC achieved 91% for the Asthma – Children’s Education & Self-Management measure, the highest rate among reporting HCH clinics. 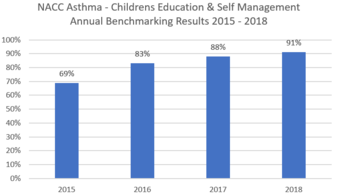 NACC has continuously improved the children asthma education and self-management rate each year for the past four years. What improvement processes did NACC put in place to achieve these results? "The improvement in Asthma rates has mostly been due to enhancements in the electronic medical record (EMR) and staff training", says Felicia Hernandez, Medical Clinic Manager. "Improvement at NACC clinic is a team effort. Everyone here works as part of a team. We focus on specific improvement initiatives each quarter. We also participate on the Federally Qualified Health Center Urban Health Network (FUHN) asthma quality team." NACC uses DocTalk, an EMR template that automatically populates the patient’s updated information and shows the last Asthma Control Test (ACT) score and date of the last asthma action plan on the pre-visit planning document. During clinic visits, patients with an asthma diagnosis are asked for an update on their asthma control. Every patient with asthma gets an ACT done. Says Hernandez, “DocTalk is a very useful tool to support educating patients. Our patients love the DocTalk tool! We also implemented automated printing of the asthma action plan with the after visit summary for patients with an asthma diagnosis." NACC has also implemented other improvement steps. “We learned that it is important to have a standardized rooming process for staff. When staff go into the exam room knowing they need to complete all the required documents it gets done. We found that when staff get to pick and choose, documents fall through the cracks.” Using the EMR generated asthma population reports, the care coordination staff determine which patients to call between clinic visits. If the patient cannot come in to the clinic, NACC does ACTs over the phone. Hernandez adds that provider buy-in is also very important. "We created a documentation guide for providers. Provider buy-in to the standard rooming and follow-up processes has made a big difference and helped with other team member buy-in. We hold regular scheduled quality improvement meetings to check in on the process and outcomes." Three MDH HCH patient stories are highlighted on the National Academy of Medicine (NAM) website https://nam.edu/HighNeeds/. To view the MDH HCH patient stories (Melissa W, Lisa W, Katie S) click “Testimonials” in the main navigation on the website. The 2018 Minnesota Alliance for Patient Safety (MAPS) conference "Reigniting Our Passion for Safe Care" will be held October 25 & 26 https://mnpatientsafety.org/events. The Minnesota Department of Health Maternal and Child Health Advisory Task Force is accepting nominations for the Betty Hubbard Maternal and Child Health Leadership Award. See http://www.health.state.mn.us/divs/cfh/program/mchatf/award.cfm for more information. The deadline for nominations is Thursday, September 28, 2018 at 4:00 p.m. CDT. September is Infant Mortality Awareness Month in the U.S., and the State of Minnesota will observe Infant Mortality Awareness Week September 23-29. The Minnesota Gerontological Society Conference Committee is seeking presenters for the 2019 Annual Conference https://www.mngero.org/2019-43rd-annual-conference/. The deadline to submit is October 5. MDH has released a new Eliminating Health Disparities Initiative Request for Proposals and is accepting applications. Eligible applicants include community clinics, faith-based organizations, social service organizations, community nonprofit organizations, tribal governments, and others. Please visit the HCH website for more information.